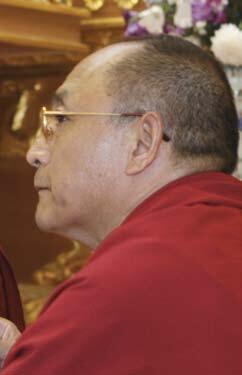 Geshe Ngawang Samten in Lerab Ling, August 2008. The Ven. Prof. Geshe Ngawang Samten is Director and Vice Chancellor of the Central Institute of Higher Tibetan Studies in Sarnath, Varanasi. Prior to assuming the Vice Chancellorship he was Director of the Research and Publications Division of the Institute. Prof. Geshe Samten earned his Shastri, Acharya and PhD from the Central Institute of Higher Tibetan Studies and his Geshe degree from Ganden Shartse Monastic University. He is editor of the Tibetan critical edition of Nagarjuna's Ratnavali (CIHTS Press), and is co-translator with Prof. Jay Garfield of Tsong Khapa's Ocean of Reasoning (Oxford University Press). Prof. Geshe Samten has addressed conferences and colloquia around the world, and has held visiting professorships at the University of Tasmania, Hampshire College, Amherst College and Smith College. Geshe Ngawang Samten is also a member of the Tenzin Gyatso Scholars Program's advisory council, which is being developed by the Tenzin Gyatso Institute. This page was last edited on 11 December 2008, at 14:01.